Historically today is the feast of St. Hilary, pope from 461 to 468 and guardian of Church unity and St. Romanus of Condat who founded the abbeys of Condat and Leuconne, and the convent of La Beaume, among others. To replace a man like Leo was not easy, but the next pope was a man after Leo's heart, the archdeacon Hilary. Hilary was a Sardinian who had joined the Roman clergy and had been sent by St. Leo as one of the papal legates to the council at Ephesus in 449. This council, intended to settle the Monophysite affair, got out of hand. Packed with Monophysites and presided over by Dioscorus, the patriarch of Alexandria, the assembly refused to listen to the protests of the papal legates. Dioscorus steam-rollered through the council a condemnation of the orthodox and saintly Flavian, patriarch of Constantinople, and an approval of the Monophysite leader Eutyches. In vain Hilary protested. He had to fly in fear for his life and hide in a chapel of St. John the Evangelist. It was only with difficulty that he got back to Rome. No wonder St. Leo called this Ephesus council a gathering of robbers! As pope, Hilary worked hard to foster order in the Gallic hierarchy. When a certain Hermes illegally made himself archbishop of Narbonne, two Gallic delegates came to Rome to appeal to Pope Hilary. He held a council at Rome in 462 to settle the matter. He also upheld the rights of the see of Arles to be the primatial see of Gaul. From Spain also came appeals of a similar nature. To settle these Hilary held a council at Rome in 465. This is the first Council at Rome whose acts have come down to us. According to the "Liber Pontificalis" he sent a letter to the East confirming the ecumenical councils of Nicaea, Ephesus, and Chalcedon, and the famous dogmatic letter of his predecessor St. Leo to Flavian. He also publicly in St. Peter's rebuked the shadow-emperor Anthemius for allowing a favorite of his to foster heresy in Rome. St. Hilary deserves great credit for his work in building and decorating churches in Rome. Of especial interest is the oratory he built near the Lateran, dedicated to St. John the Evangelist. The Pope attributed his escape from the wild Monophysites at Ephesus to the intercession of the Beloved Disciple, and to show his gratitude he built this beautiful oratory. Over its doors may still be seen the inscription, "To his deliverer, Blessed John the Evangelist, Bishop Hilary, the Servant of Christ." Hilary built two more churches and spent freely in decorating still others. The gold and silver and marble used so lavishly by this Pope in adorning the Roman churches indicate that the wealthy families of Rome must have saved something from the grasping hands of Goths and Vandals. 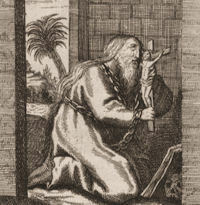 St. Hilary died on February 29. His feast is kept on February 28. 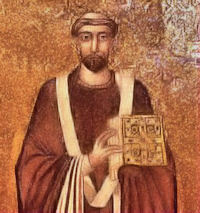 Saint Romanus of Condat (c. 390 - c. 463) is a saint of the fifth century. At the age of thirty five he decided to live as a hermit in the area of Condat. His younger brother Lupicinus followed him there. They became leaders of a community of monks that included Saint Eugendus. Romanus and Lupicinus founded several monasteries. These included Condat Abbey, which was the nucleus of the later town of Saint-Claude, Jura), Lauconne (later Saint-Lupicin, as Lupicinus was buried there), La Balme (Beaume) (later Saint-Romain-de-Roche), where Romanus was buried, and Romainmôtier (Romanum monasterium) in the canton of Vaud in Switzerland. Romanus was ordained a priest by St. Hilary of Arles in 444. Read more about Bl. Daniel Brottier at The Catholic in Me and at CityDesert.